With the weekend here, you probably want to buy a little beauty "fix", but your budget may be tight. So here's another one of our most popular under drugstore buys that you will love! Tester: Asian (Indian) about Parminder Nagra’s (from the ER television show) complexion with dark brown eyes. “This is definitely one of the most amazing eye color products out there now! Not only are these a fantastic deal, but the colors are gorgeous. The pigment is so rich and these lasted all day for me. I used the Midnight Blue which is a vibrant navy blue jewel tone that made my brown eyes pop and looked so good with my skin tone! I'm always on a quest for an eyeliner that looks fantastic and won't budge. 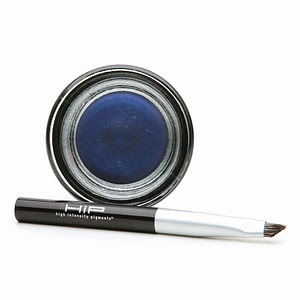 This is a very pigmented, high-quality gel/cream eyeliner. I experienced smooth lining, high density color, excellent wearability. This eyeliner comes in a little pot with a cute eyeliner brush. Note that the brush is quite short and the brushes are hard, so some of you might prefer to use your normal eyeliner brush, but I found that it was perfect for getting the perfect amount of eyeliner on my lash line and staying close for application. It's highly pigmented so a little really goes a long way. I put it on in the morning, went about my hectic day at work, and my liner looked PERFECT, just like when I put it on – each and every day. I didn’t have any smudges, even under the eye. The bottom line: I've never loved an eyeliner like this.